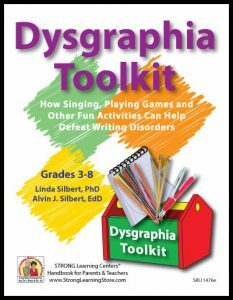 Get Your Dysgraphia Toolkit Today! Extensive research has shown that children learn best when they are engaged and having fun. That’s why every activity in this guide is designed for children to have fun while learning to write. This is especially important for the child who has dysgraphia! The conundrum is that children with dysgraphia need to practice more than their peers – but they hate to write. Since self-esteem develops around the same time a child learns to read and write, children with writing trouble face a two-pronged attack on their self-esteem. In this book you’ll find activities to be uses over and over again to help improve writing skills at all levels. Sign up for our newsletter and download your copy of the Dysgraphia Toolkit today! While you’re there, grab the Dyslexia and Dyscalculia Toolkits, too! Linda & Al Silbert have dedicated over thirty-five years to the growth and enhancement of children’s intellectual, emotional, and social development. The Silberts have written over forty books for children in kindergarten through college which have sold over one million copies. They lecture and lead workshops to help children succeed in school and beyond and have appeared on radio and television throughout the U.S. and Canada. As directors of the Strong Learning Centers based in Chappaqua, New York, they continue to collaborate as writers and educational therapists. The Silberts have two grown children and two grandchildren. They live in the suburbs of New York.